Home › Investing › What Is Betterment Tax Loss Harvesting? What Is Betterment Tax Loss Harvesting? Betterment is head and shoulders above most of its rivals in the robo-advisor industry with over $13.5 billion in assets under management and hundreds of thousands of clients. One reason for its success is that for Betterment taxes are a key focus. Betterment claims investors can enjoy as much as a 2.66% boost in annual returns using its platform. Unlike many traditional advisors who primarily focus on investing returns, Betterment concentrates just as much on making sure you get to keep the bulk of those returns through tax-efficient investing. Does Betterment Tax-loss Harvesting Work? How Much Does Tax-Loss Harvesting Cost? What Are Betterment Tax Coordinated Portfolios? How Does Betterment TaxMin Method Work? Remember when you received your first paycheck and saw all the tax deductions? That sinking feeling of knowing you take home a lower amount than you earn is mirrored when investing in the stock market. The tax impact of selling often can lower the size of your portfolio significantly over the long-term compared to buy-and-hold and tax-advantaged investing approaches. According to Betterment, tax-loss harvesting and tax-coordinated portfolio strategies combined can boost investor returns by as much as 2.66% annually. Over 20 years, Betterment claims that can add up to an additional $147,809 in your pocket versus the government’s. To highlight just how much taxes can affect your long-term wealth, imagine you and your neighbor both invest $100 over a very long time period of 60 years. We will use the long timespan to emphasize the effect of taxes. Now assume both portfolios grow at 15% each year, but you decide to lock in your gains each year while your neighbor holds her portfolio until the end of the period. If each year you pay short-term capital gains tax of say 30% (to keep the math easy!) and your neighbor pays 20% in long-term capital gains tax at the end of the period, how much wealth do each of you accumulate? By not locking in gains through selling at the end of each year, your neighbor ends up with a retirement portfolio 6x larger than your nest-egg. Just think what a difference it would make to your retirement lifestyle to have six times more in savings. That’s the difference between having $6,000,000 versus say $1,000,000! Taxes are one of the largest costs and drags in building your wealth over the long-term, so how does Betterment fare when it comes to tax-efficient investing? Betterment makes the bold claim that its goal is to save you more on taxes than any other service. Betterment tax-loss harvesting and tax-coordinated portfolios are two primary methods of lowering tax liabilities. Tax-loss harvesting is a method of offsetting capital gains and income by selling losers against winners. When the losing position is sold, the loss counts against gains from winning positions, and the losing position is replaced by a similar one in order to maintain an optimally diversified portfolio that aligns with your risk profile. Betterment research shows that a $50,000 starting portfolio with a 70% allocation to equities with bi-monthly deposits of $750 has enjoyed additional after-tax returns of 0.77% annually. While less than 1% in additional gains yearly may not seem like a lot, the increase due to tax-loss harvesting amounted to $44,692 over a 13-year period from 2000 to 2013 according to Betterment. Tax-loss harvesting algorithms run every day throughout the day to lower your tax burden, a frequency rate higher than many other automated tax-loss harvesting tools. And tax-loss harvesting is available to Betterment Digital and Betterment Premium customers 100% free of charge. Trivia: Losses on investments can not only offsets gains but also lower ordinary taxable income by as much as $3,000 per year. Betterment was the first and, for a long time, only investment company to automate asset allocation using advanced computer algorithms. Research from Betterment shows that tax-coordinated portfolios can save as much as 0.48% annually, and increase portfolio value by an estimated 15% over 30 years. The account selection you make, whether traditional IRA, Roth IRA, or regular taxable account, will affect how much you pay in taxes because each is taxed differently. At Betterment, the goal is to figure out which combination might be best for you by placing tax-inefficient assets in tax-efficient accounts and tax-efficient assets in tax-inefficient accounts. Portfolio Selection ETFs are selected because they are generally more tax-efficient and lower cost than mutual funds. Municipal bonds provide tax-exempt income and so are used in taxable accounts. 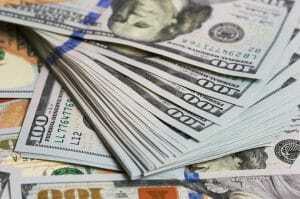 Core bonds which are not tax-exempt are used in tax-advantaged IRAs. Deposit and Dividend Treatment Selling stocks can trigger tax liabilities, but sometimes selling is needed to protect from volatility. Betterment gets around this dilemma by automatically rebalancing using deposits and dividends. Allocation Changes and Withdrawals Betterment sells assets in a specific order so the ones with the lowest tax burden are sold first. Plus, you get to see possible tax implications before you make a transaction. When Funds Lose Value When investments go into the red, you can sell them to offset the tax liability from capital gains and income using Betterment’s Tax-Loss Harvesting+ feature. Betterment research shows tax-loss harvesting can improve after-tax returns by as much as 0.77% annually. Brokers generally use the industry standard FIFO method when shares are sold in your account. Betterment has developed an equivalent proprietary yet superior approach, called TaxMin, to lower taxes. In a nutshell, the way it works is that when reporting security sales to the IRS, you can reduce your tax liability by selecting specific tax lots. Betterment automatically calculates the cost basis and duration of lots and selects the optimal one to sell based on which lowers your tax liability. For example, if you wish to withdraw a dollar amount from your account, it will translate into a fixed number of shares. But the choice of which shares to sell can drastically impact what you pay to Uncle Sam at the end of the year. Each broker has a default method of choosing which shares to sell and the approach used by Betterment is superior to the industry standard. 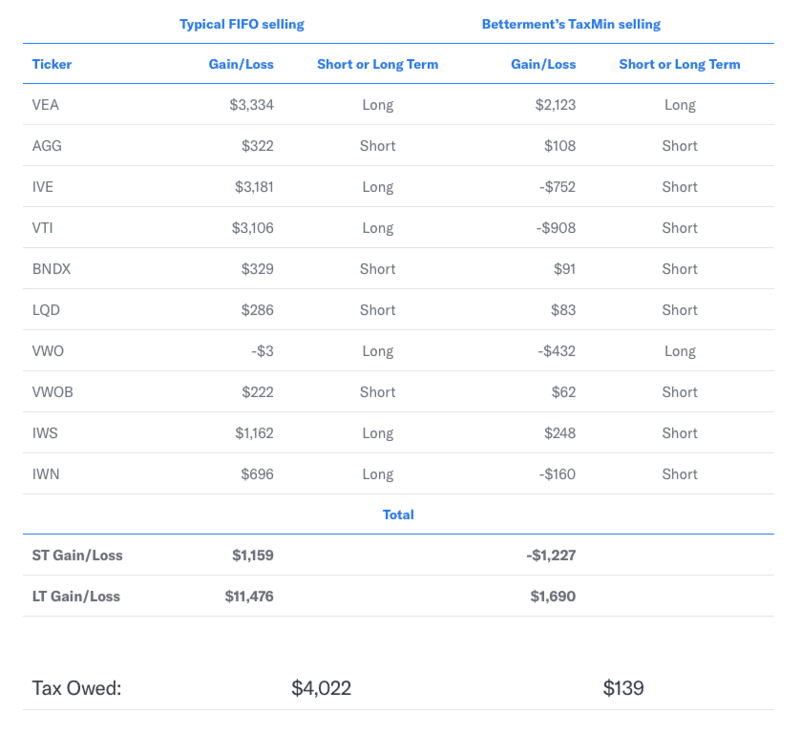 A customer who wishes to withdraw $100,000 can save as much as $3,883 using Betterment’s TaxMin selling method versus the industry standard FIFO selling approach. Unlike most brokers, who use the FIFO method that looks only at the time a lot was purchased, Betterment factors in cost basis too so that the tax burden is even lower than the industry standard. Betterment has developed a series of rules called TaxMin which automatically kick in when customers decide to sell investment holdings. Compared to the industry standard FIFO method, TaxMin is far more granular and more tax-efficient. In the FIFO, or first-in-first-out method, brokers only consider the time of purchase. However, Betterment looks not only at the time of purchase but also at the cost basis as part of its automated algorithmic tax-advantaged TaxMin feature. The TaxMin algorithm exploits all taxable opportunities in one category before moving to the next. In each category, the higher cost basis lots are sold first to lower your tax bill when gains are considered. When losses are evaluated, higher cost basis positions lead to greater losses, so these positions trigger first. Betterment increases after-tax returns by a combination of tax-advantaged strategies. Tax-loss harvesting has been shown to boost after-tax returns by as much as 0.77% annually while tax-smart asset allocation can increase returns by as much as 15% over a 30 year period. A combination of tax-coordinated portfolios, automated tax-loss harvesting, TaxMin lot selling and automatic rebalancing means Betterment customers are likely to enjoy higher after-tax returns over the long-term than most casual investors who invest in mutual funds via traditional human advisors. >> What Is A Betterment SRI Portfolio? >> What Is A Betterment Tax-Coordinated Portfolio?